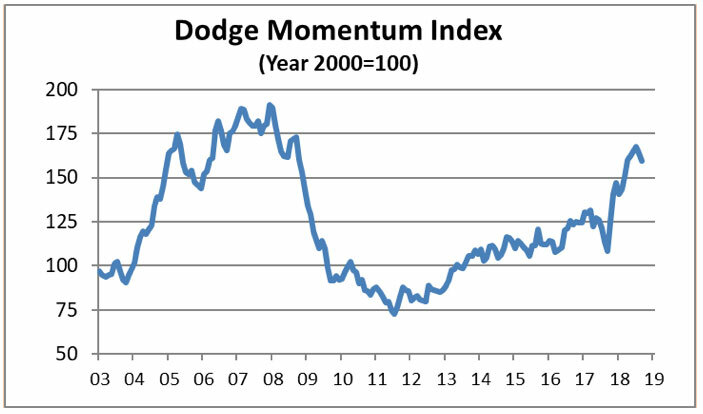 New York — The Dodge Momentum Index dropped 2.6 percent in September to 159.5 (2000=100) from the revised August reading of 163.7. The Momentum Index is a monthly measure of the first (or initial) report for nonresidential building projects in planning, which have been shown to lead construction spending for nonresidential buildings by a full year. Both components of the Momentum Index were lower in September; the commercial component fell 4.3 percent, while the institutional component lost 0.1 percent. The Momentum Index has now fallen for two consecutive months; however, due to a very strong reading in July it increased 0.8 percent from the second quarter to the third quarter. The Momentum Index may seem to have lost some impetus, but this can be attributed to outsized gains in the late spring and summer. In fact, the Momentum Index is now returning to a more sustainable level of activity given the overall age of the current construction cycle. In September, 12 projects each with a value of $100 million or more entered planning. The two leading institutional projects were a $175 million research lab in Waltham, Mass., and the $150 million Creighton University Medical School building in Phoenix. The leading commercial projects were a $116 million warehouse in New Castle, Del., and a $100 million mixed-use commercial building in Los Angeles.